Wednesday, 9/1/10: No After-School Rehearsal. Optional after-school activities TBA. Friday, 9/3/10: Moody vs. Briarwood, away. Stay after school, supper provided, load buses as buses return from afternoon routes. Depart by 5:00. Details TBA. Reminder: Bill Miller will be re-doing photos on 9/7/10 at after-school practice. Bring your old photos to trade for retakes. If you haven't already acquired an instrument for beginner band, I hope your search is progressing well. If not, please let me know how I can help. The sooner you have your instrument, the sooner you'll be making music! If you are borrowing a school-owned instrument from us, be sure to complete a sign-out form. We will begin keeping practice records next week! Excellent performance at SCCHS last night! There will be no after school practice this afternoon, but we will resume our regular schedule next week, traveling to Briarwood next Friday. More details to come soon. Moody vs. SCCHS at SCCHS Tonight!! You are dismissed at the 3:00 pm bell today after the pep rally. Return to the band room at 5:00 for roll call. We depart at 5:30 and will return at 10:30. Full uniform. December and April Concerts Scheduled-- All Bands! We have concerts scheduled for December 3, 2010 and April 28, 2011. Concerts take place at the MHS gym. More details will follow, but be sure to mark your calendars now. If you plan to make a trip to Irondale soon and wouldn't mind delivering the band room vacuum cleaner to the House of Vacuums on Crestwood Boulevard for repairs, please let me know at brad.sargent@sccboe.org. Your assistance would be appreciated. Friday, 8/27/10: No after-school rehearsal. Enjoy your afternoon off. Be sure to practice over the weekend! COMING SOON: An updated calendar with more details of the year ahead. Bill Miller Photo will be re-taking band photos on 9/7 at after-school practice. If you want to replace your previous photos with new ones, please bring the old to exchange. Thursday, 8/26/10: MHS vs. SCCHS, away. Call time 5:00 pm. Depart at 5:30. Return at 10:30 pm. Friday, 8/27/10: No After-School Practice-- Enjoy the afternoon and get some rest! Please note: Weather permitting, we will begin outdoor rehearsals during the regular 4th block/7th period band class. Remember to bring appropriate clothing, water, sunscreen, insect repellent, and anything else you may need for an afternoon outdoors. Our goal this week: Add Jet Song to our Thursday performance, play and march more cleanly overall, and add more stand tunes to our repertoire! See the blog post titled "Extra T-Shirts" to see a mockup of the design by Hannah M. and Taylor G. Today, Friday, 8/20, is the last day to submit your order to Dr. Sargent. These are not uniform t-shirts. Purchase is optional. $12.00 each. All orders are prepaid. We should have these shirts in two weeks or less. It's not too early to begin thinking about all-state, all-district, solo and ensemble, and honor band participation. Many honor bands are posted on the band room bulletin board, and information on all-state may be found on the Alabama Bandmasters' Association link on our website. Ask Dr. Sargent for more information. Tomorrow (Friday) is the last day to order the special T-shirt designed by Hannah M. and Taylor G. Shirts are $12.00 each. Submit an order form (found on Yahoo Groups files or in the band room) to Dr. Sargent, along with your check or cash made payable to the Moody Band Boosters. The shirts are natural with a multi-colored West Side Story logo on the front and may not be worn under the uniform. Roll call is at 5:30 this afternoon in the band room. Dress is the uniform T-shirt, long shorts, and closed-toed shoes. We will leave after halftime and return to Moody by 8:30 pm. Any rain delays or cancellations will be posted on the website and Yahoo Groups. Please show your support for the band program by completing a parent profile form, found on our Yahoo Group site under "files" or on the table in the band room. We need your help, so let us know about your unique skills and talents! After-school rehearsals take place through the season on Mondays, Tuesdays, Thursdays and Fridays except on performance days. Please see the band handbook for excused absence/attendance policy. Jamboree game vs. Springville Thursday, away. Call time at MHS band room: 5:30 pm. More details to come. Band Shoes are here. If you ordered band shoes, please bring cash or check to the Moody Band Boosters in the amount of $30.00. 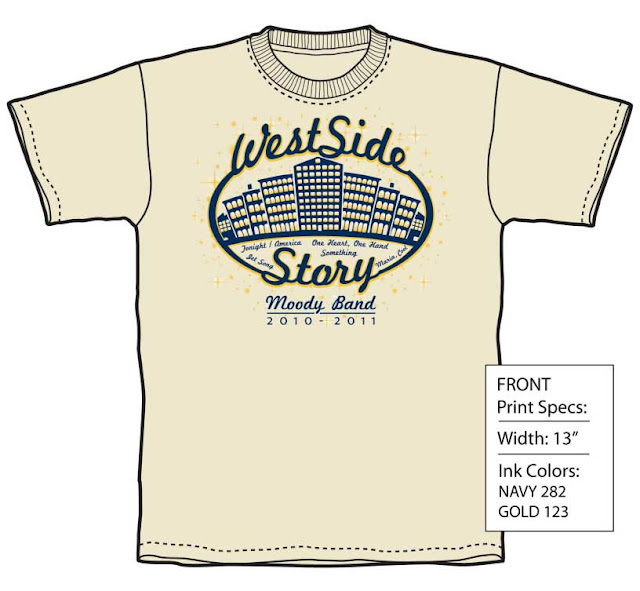 Extra Band T-Shirts: Shirts are a cotton blend, natural color, West Side Story logo on front. These are not the uniform T-shirts. Purchase is optional. $12.00 each. A mock-up will be posted ASAP. Make checks payable to the Moody Band Boosters. Order forms are on Yahoo Groups Files and in the band room. Submit orders to Dr. Sargent. Order deadline: This Friday, 8/20/10. A supplies list from Art's music is on the bulletin board in the band room. Most supplies are on hand. Make checks for in-stock items payable to the Moody Band Boosters. Band Activity Fees are $20.00 per semester per registered band student, 7th-12th grades. 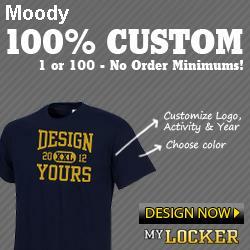 Make checks payable to Moody High School and submit to Dr. Sargent. Do not place in money box. Receipts will be issued the following day. Due date for band activity fees: October 31. Band Boosters will meet Tuesday, 8/17/10 at 6:30 in the band room. Parents and guardians interested in serving as chaperones any time during the season should plan to attend the chaperone meeting at 6:00 pm prior to booster meeting. Beginner band instrument night is August 24 at 6:00 pm in the MHS lunchroom. Mandatory attendance for all beginning band students and parents/guardians. Please fill out a parent profile form while you're there! See Dr. Sargent for applications. Lost Music: All students are issued music for flip folders now. Lost music may be copied at $1.00 per page by our student librarians. Checks made payable to the Moody Band Boosters. Monday: Rehearsal 3:15-5:00-- Bring water and appropriate clothing for all after-school rehearsals! Thursday: Jamboree Game vs. Springville, away. Call time in band room: 5:30. Game begins at 7:00 pm. Friday: Due date for T-shirt orders. After-school rehearsal 3:15-5:00 pm. We will have a chaperone training session in the band room on Tuesday evening, August 17 at 6:00 pm before the band booster meeting begins. Thanks to all who are willing to volunteer as festival, home, and away game chaperones for the season. The Blue Devil Day football scrimmage has been cancelled because of rain. The BBQ dinner planned for this afternoon will be rescheduled to a later date. Thanks to all band members and volunteers for your work in preparation for today. We will continue to prepare and look forward to our jamboree game against Springville next week. See you at rehearsal on Monday! Many have expressed interest in ordering additional band T-Shirts. We will take prepaid orders until Friday, August 20, 2010. Order forms will be available in the band room, on this website, and on Yahoo Groups. The shirts are a high-quality cotton blend (similar to Beefy-T), and are designed by our own Hannah M. and Taylor G. The shirts are not the Under-Armor style shirts issued at band camp and should not be worn under the uniform. Color: natural with 2-color artwork on front. $12.00 each. Cash or check payable to the Moody Band Boosters. Estimated ship date: September 10. Place your order by submitting a hard copy of the order form with a check or cash by August 20. Please do not e-mail orders or send orders through Yahoo Groups. Tuesday, 8/10: Rehearsal 6:00-8:00 pm. Meet in band room first. Saturday, 8/14: Blue Devil Day. Roll call in band room 4:50 pm. Dinner in multipurpose room 5:00 pm. Warm-up in band room 6:00 pm. March to stadium 6:30 pm. Game 7:00. Half-time show 7:45. Return to band room by 8:00 and dismissal. If you are able to help in the concession stand clean-up this Thursday at 6:00 pm, please call Mildred McCombs, coordinator, at 205-566-5551, to let her know of your availability. Volunteers are needed this Thursday, 8/12/10 for a band booster concession stand clean-up day. The cleanup will begin at 6:00 pm. We are in need of volunteer chaperones for the season. If you are willing to help, please contact our chaperone coordinators, Rhonda and Doug Marsh, at rdmarsh@windstream.net, to be placed on the chaperone list. We will schedule a chaperone training session soon. Program ad forms may be dropped off at the band room from 3:00 until 5:30 today (Friday), 8/6/10. Thank you for supporting the Moody bands!